Join the lovable critters of the undergrowth in this nature themed slot adventure. Leave no leaf unturned while playing this game and watch out for the colossal antics of the marching ants – When you see this you know you’re onto something. Blueprint is a UK based developer that has been making online casino games for many years. In 2008 the company was acquisition by the German Gauselmann Group which elevated their profile. Blueprint already has a wide variety of games in their profile, offering a range of jackpot prizes to be won. Their games do not require a download which makes them compatible with many of today’s online casinos. Many of their games are now playable on mobile devices, giving this online development company an even broader appeal. 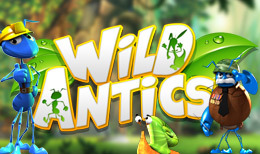 Wild Antics is set deep down in the depths of a big clump of grass, you’ll meet a group of hard working ants who will do their very best to help you win some big jackpots. This insect themed online slot game is visually stunning and quirky at the same time, guaranteed to give you lots of fun while you are spinning those reels. You have 5 reels, 3 rows and 20 fixed paylines. You can play for a minimum of 20p up to an impressive £500 per spin. The reels are set against a woodland background with leafy grass and ants enjoying a game of golf. The exceptional graphics are bright and cheerful, and you have some fun symbols decorating the reels such as a Slug, a Ladybug, and a Caterpillar. You also have the traditional playing card symbols from 10 to A. The Wild is a Blue Ant symbol. Aside from the Bonus or the Scatter symbol, the Wild can substitute for any symbol on the reels to help you match those winning combinations. Before Wild Antics begins, you will see three ants wearing goggle and jet packs strapped to their backs. A sign reads: ‘Jet Packs Antics!’ and goes on to tell you that randomly during any spin, Adam the ant can appear and cause some crazy antics. It’s up to you which ‘crazy antics’ you want to put in play, you have four choices: Aardvark Antics randomly turns reels Wild, during Frantic Antics reels symbols are shuffled into a series of winning combinations. Colossal Antics causes the ants to march onto your screen and award a number of Wilds, and Wild Antics results in a number of positions being turned into Wilds Antics. When the Bonus symbol appears on the 1st and 3rd reels you will be rewarded with a Free Spins game. During this game there are Roaming Wilds which only appear on the 5th reel. The Worker Ant Bonus Wild will roam around the reels during your free spin further increasing your chances of forming a winning combination and the Soldier Ant Bonus Wild not only roams but comes with multipliers from 2x to 5x. The Colonel Ant will roam and expand to cover entire reels. And the Queen Ant Bonus Wild will not only roam, but anywhere she appears expands the colossal Wild! Wild Antics is full of bonus features to help you win impressive jackpots. This fun online slot game comes with a good betting range which means any player can join in on the antics!